Children at Special Kids had a ball on Monday, July 9, when two former MTSU players and new NFL recruits Sammie Seamster and Jimmie Staten joined in the Bible study and music time at the nursing facility. 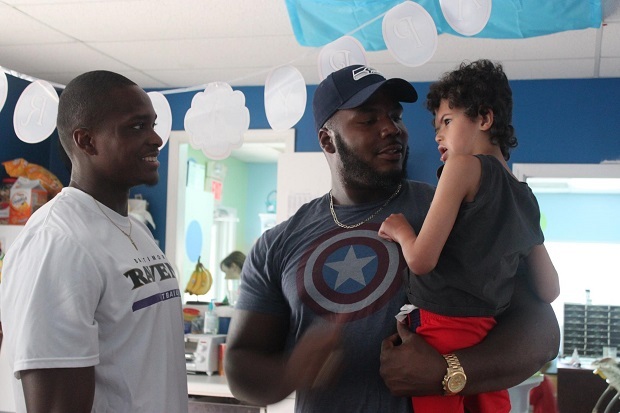 Seamster with the Baltimore Ravens and Staten with the Seattle Seahawks enjoyed spending their break time from NFL training camp with family and friends as well as some special children at Special Kids. "I was a little worried that the kids would be intimidated by their size," said Stephanie Folkmann, director of development at Special Kids. "But the guys joined right in and quickly had children climbing all over their laps. It was great for children to see and hear from football players what it means to be kind to each other." Pediatric nursing services at Special Kids focuses on providing professional care to medically fragile children in need of a safe place while their parents go to work. The children have several activities throughout the day to enhance their learning while they receive the medical treatment they need.